One of the most common reasons that people shy away from cooking salmon is fear over not doing it right. We’ve all had dry fish that just doesn’t taste perfect; but it’s not the fish itself that’s the problem,but rather how you are cooking it, or rather overcooking it, which is typically the case. The trick to making delicious, moist, perfectly prepared wild salmon is to know when it’s ready, and to be sure not to over-do it where cooking times are concerned. 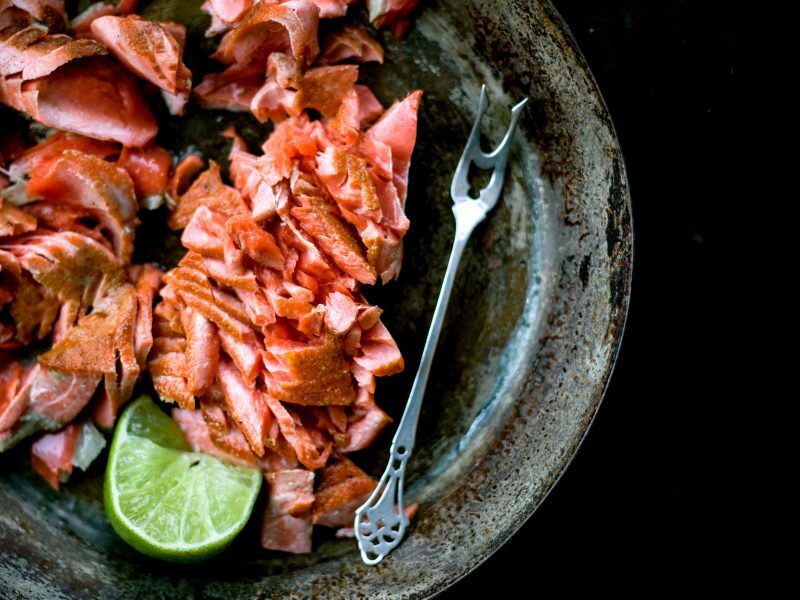 With these foolproof tips and tricks you’ll be able to get your wild salmon right every time. First, it’s important to know that every cut of wild salmon is different, just as every stove-top/oven is different, which means there is a certain alchemy to cooking it perfectly. In addition, there are several key differences between wild and farmed salmon. Wild salmon is known to be far better for you from a nutritional standpoint, and that means less fat. Most people are used to cooking and eating farmed salmon, which is takes longer to cook because of the higher fat content. Because they are used to that cooking process (and cooking time), they assume wild salmon is the same, and end up overcooking (and thereby ruining) it. It’s a lack of knowledge more than anything, and this misconception often leads to unnecessarily overcooked salmon. Cooking wild salmon to perfection isn’t a skill that requires years of practice. All you really need are a few tricks so you know what to look for when your fish is done cooking, and you know how to ensure that your fish ends up flaky, delicate and cooked to perfection. Remember that the idea that wild salmon just tastes drier is a misconception. Wild salmon is actually tender and delicious. In almost every case, the only reason your salmon might taste dry is because you are overcooking it. How Do You Know When Your Fish is Done Cooking? With certain foods it is extremely important that you cook your protein all the way through for safety reasons. No one wants to eat raw or undercooked poultry. But when it comes to fish, especially wild salmon, finding the sweet spot where your fish is cooked but not overcooked is key. You want to make sure your fish is prepared to your liking, whether you want it cooked all the way through or you like it a bit raw on the inside, and not cooked so much that it becomes dry or tough to chew. So how much is too much? What should you look for? Here is how you know your wild salmon is done for each common cooking technique. Cooking salmon on a stovetop by pan searing or pan-frying is a quick and easy way to prepare fish. It only takes about 3-4 minutes per side, so in about 6-8 minutes you have a perfectly cooked fish. Start with the skin side up, then flip the fish and cover the pan with a lid to cook the second side. To check if the fish is done, cut the filet at the thickest point and make sure the fish is flaky in the middle. If it is a thinner cut of fish, reduce the cook time by 1 minute per side, and remember you can always cook your fish more, but you can’t go back in time once your fish is too well done. If you are oven-baking or broiling your wild salmon it’s a little bit harder because you aren’t watching your fish every second while it cooks. With both of these cooking methods there is no need to flip the fish, just let it cook and check to make sure it is cooked to your liking once it is ready. With roasted fish typically 8-12 minutes at 400 degrees will do the trick (less time for a thinner cut of fish), and for broiled fish 5-7 minutes at medium-high heat will be enough. Again, make a small cut at the thickest part of the fish to see if it is flaky but still translucent; remember less is more and you can always add an additional minute of cooking time as needed. When poaching fish, bring water to a boil and then reduce the heat so the liquid begins to simmer. Place the fish filets in the liquid so they are submerged and cook for 6-8 minutes. When the fish is ready the inside at the thickest point should be slightly translucent but not raw. Think pink and slightly shiny but not like a piece of sushi. Even with foolproof recipes and specific cooking times, we all get distracted and forget to take our fish off the heat or out of the oven. Set a timer, and ideally set two timers: one for a one-minute warning and one when you are supposed to stop cooking the fish. Then check its progress and adjust your cooking time as needed. Keep an eye on your fish as it cooks. The cooking times are suggestions but based on your specific cut of fish and how large or thick the filet is, the cooking time could vary drastically. Plus some cooking surfaces cook faster than others, so your best bet is to keep an eye on things as you work. If a fish looks really well done or burnt, it’s probably already overcooked. You can use a fork to break off a small bite of fish, and if it flakes nicely, it’s done. If it’s hard to break off and raw inside, it needs more time. And if the texture seems tough, it’s overcooked. Most importantly, even after you remove your fish from the oven or stovetop, it will continue cooking! The inner temperature of the fish will still be high even if the exterior temperature is reduced, so the fish will cook a bit more on the inside even after you think it is done. Which is why making sure that your fish is slightly translucent on the inside is so crucial — even once your fish is plated and ready to serve, it will continue cooking until it is perfect.